I've been wanting to share this good news with you for a while but I was waiting for the issue to arrive everywhere. 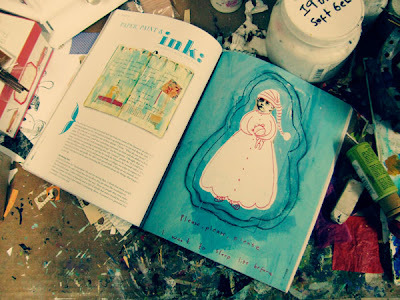 I wrote an article for the Autumn issue of Art Journaling magazine! It's all about going back to basics with great tips for beginners and for busy art journalists. I have several journals already finished and I'd like to share some of the pages from those with you since there are not many pictures of the one I sent in the magazine (and I don't have it with me yet). I like a lot to use a picture from myself when I was about 5 years old and I'm dressed as a flower with my older sister's costume in my journal. Sometimes I just cut the face and paste it on other body. 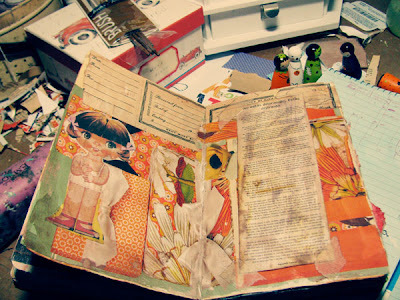 I also have LOTS of scrap paper from my collages and I use that as well as ephemera and other things I find around. 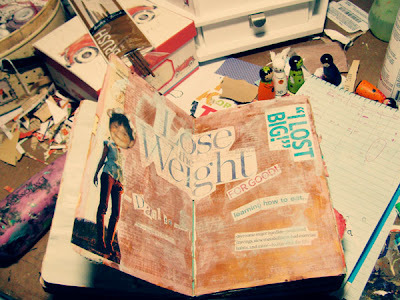 I'm a visual person and I don't write much on my art journal. I usually feel that I express myself better with color and shapes or that someone else has said it better so I print and paste the text on my journal. Other times I use mostly paint to fill the backgrounds and a mixture of drawings, paper and stamps. A few words and pictures can say a lot sometimes. Other times I just journal about the most trivial things. I have entries in my journals about days I wanted to go out but couldn't or just with images or color combination or candy wraps that I like. Before becoming a painter I used to draw the most memorable thing in my day in a notebook and I still can remember pretty much what I did just by looking at those little drawings. Remember my last post with lots of Gocco printed images? 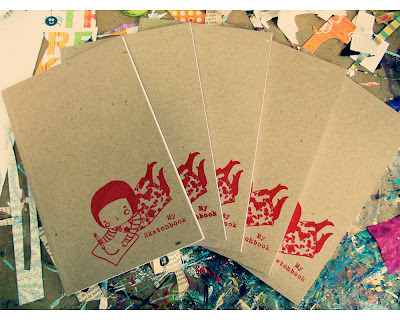 I got carried away and I made a limited edition of 60 Sketchbooks. (ruled, squared and blank) and they're 5x8 each and made with recycled fibers (so you won't feel guilty for getting more than one). The magazine has inspired me to start journaling and I'm having so much fun. C O N G R A T U L A T I O N S!!! That is so exciting and much deserved!! 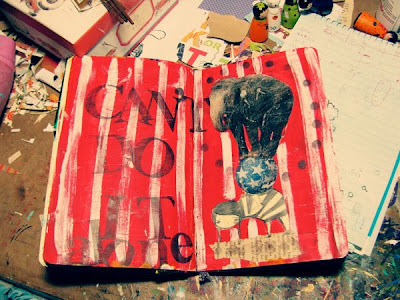 i love your art journal pages...fun!!! I will definitely have to check out your article!!! I just signed up for a journaling class at a retreat I will be teaching at , I hope it gets me doing it.My hubby is going to take the class with me too!!!!! 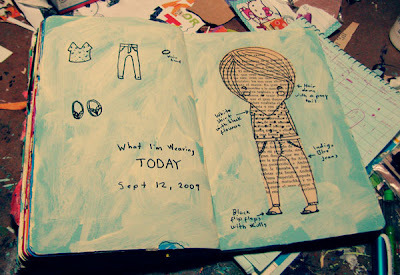 It's so nice to see some of your art journal pages. Gets me in the mood to do the same. 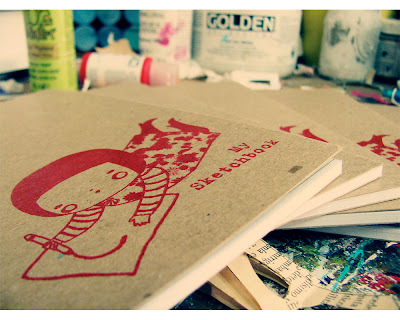 Lovely sketchbooks too! Must get myself one of those! Adventurous Art teacher... you're right, that doesn't look much like my usual work.. but that's the point :) I can experiment and do other things in there... it helps me refresh! 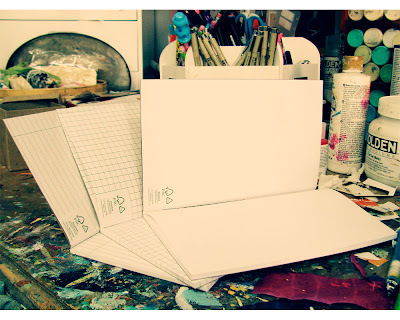 I fell in love with your Gocco images the other day, on your Blog...so when I woke up this morning to your new sketch books...well, I bought them at 6:00this morning before work! It made my day! So do you, Danita. 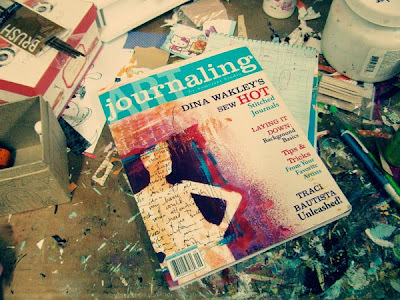 I just love your words and art in Art Journaling Magazine. wow must be so very cool seeing yourself in print like that!!! HOla Danita!!! Me encanta todo lo que realizas y es que hasta el collage tiene su grado de dificultad, es todo un arte saber dónde y qué papelitos pegar. Es fascinante tu trabajo!!! Al igual te felicito por tus libros para bocetos, son toda una novedad!! Espero algún día tener uno en mis manos. Exitos en todo sie1mpre!!! Abrazotes! Tú fan No. 1 de Guatemala!!! OK, I have bought all these magazines that I have never bought before because of you and now I am making another trip to Borders to get this one! I just love all your creations and after reading your blog, well, I'm definitely in your Fan Club! wonderful! i am getting into the journal thing and these just make me want to do it more! A week already!!! New dolls in the shop!